The advanced design of our ADI hydraulic chain saws provide you with speedy cutting, cool running, light-weight, and enduring efficiency. 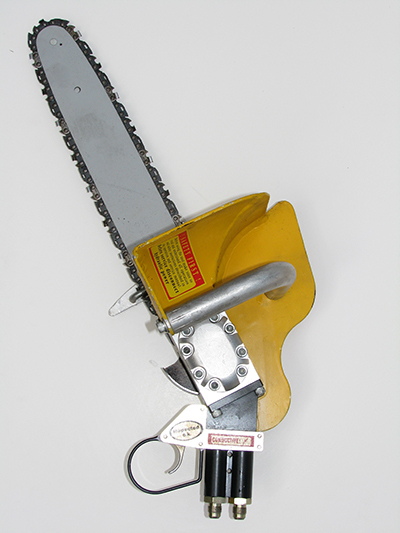 At less than 6 pounds weight, the ACS pistol grip chain saw’s high torque motor achieves up to 6 HP. With our priority on operator safety, the ACH chain saw comes with its unique kick back chain brake. Compared to other hydraulic saws, it delivers the fastest chain speed at a given flow rate. Our ADI chain saws eliminate heat generation within the tool via our patented spool system. This both increases the tool’s safety and lengthens its life. Due to the above highly developed design features, ADI tools have the lowest overall costs of any other hydraulic pruning tool available today.